1/2 size guitars are very popular for young students since the age between 5 and 8 years is the perfect age to start learning guitar. 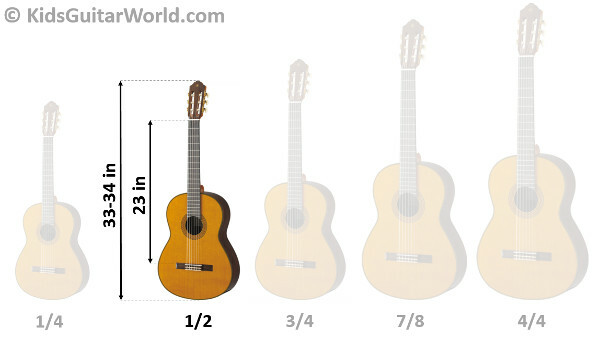 Guitars from this size are also called 34 inch guitars. Kids in this age are already enough matured to learn something seriously and capture things easily. These small guitars for children are also very famous among travelers and backpackers thanks to the small size. However, a 1/2 guitar doesn’t measure just the half of a full size guitar. Instead, it measures the half of the scale of a standard size guitar. Nylon string, steel string or electric guitar? If you are getting your child’s first guitar and you don’t know what guitar type might be the best, then take read our article about guitar types for kids. Most models available are classical nylon string guitars. Let’s start with a brand everybody knows although you have nothing to do with musical instruments: Yamaha. The huge manufacturer Yamaha offers also student guitars in different sizes. The Yamaha CGS 102A is great student half size guitar for a really fair price. It features a spruce top which ensures a good sound quality. The intonation of Yamaha guitars is normally really accurate as well as the action is pretty low which makes it easier to press down the strings. They also stay in tune for ages and are nicely finished. That’s definitely a beginner guitar to recommend. Another nice ½ size nylon string guitar is the Cordoba C1M 1/2 which features also a spruce top. 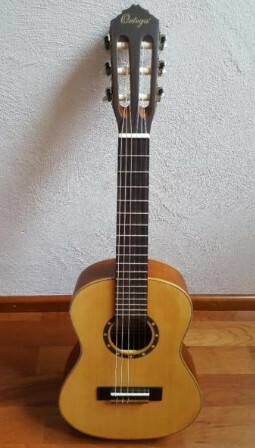 Cordoba is a leading manufacturer of classical guitars and their guitars are designed in typical spanish style. It doesn’t come with a gigbag or any other accessoires. So make sure to get those items when buying this guitar, such so at least gigbag, tuner and capo and a pair of strings). It has a lovely finish and sounds quite full for a 1/2 size small guitar. Considering the quality of this instrument the price is really reasonable. Same conclusion as for the Yamaha student guitar: you can’t do anything wrong with buying this one. Both instruments are great entry-level guitars and are worth buying. One of my favorite ones is the Ortega R121. Ortega is not a really popular brand in the U.S. but on the way to get well-known. Originally the brand is from Germany and you can find the guitars over there in many guitar shops. In my opinion this student guitar doesn’t sound only great it also looks really beautiful. It comes with a high-quality gig bag and strings from D’Addario. A good gigbag is especially important when your child wants to go to guitar lessons in order to protect the instrument and to transport it easily and comfortably. The guitar is from the Oretga Family Series and they offer all other guitar sizes as well. If your budget is quite limited, then take a look at the Hohner HAG250P. It costs only about the half of the classical guitars. You can’t compare this guitar with a kid’s guitar from Yamaha, Cordoba or Ortega since quality regarding the finish and the sound are pretty lower. The out of the box setup may vary (sometimes quite alright, sometimes is the action too high). 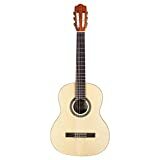 A guitar to consider for parents who are on low budget or who are not sure if their child will stick with the guitar or not. A steel string guitar is only a good choice for children who have already played regularly on a nylon string guitar before. If you are looking for a 1/2 size acoustic guitar, then the OGHS 1/2 from Oscar Schmidt might be an good option. For the price and the size, you can’t expect the sound of a full size dreadnought guitar. But considering the price the sound is alright and it seems to be well constructed. It’s one of the few good acoustic steel string guitars on the market. Electric guitars are also equipped with steel strings but they are a way thinner. In addition to that, the action of electric guitars is quite lower than on acoustic ones. That’s why a child can also start on an electrical guitar since the strings may hurt the fingers in the beginning just a bit more than nylon ones. There is not a large choice for 1/2 size electric guitars but there is one model which is exactly the guitar most guys are looking for. Although the Viper looks really small, this electric guitar is not a toy but an actual instrument. It serves also a nice travel electric guitar and is available in different colors, such as blue, red, black, and pink for girls. It comes with all necessary equipment, such as amplifier and cable. When buying another electric guitar, don’t forget to get an amplifier and a cable as well since most electric guitars don’t come with any equipment.